This page consolidates links to PDF brochures, some also found elsewhere on the site and some only on this page. I have quite a few original examples from 1954 to 1983 (some provided to me by Göran Årelind) plus scans of others provided by Tom Heckhaus, Chris Whelan, Leigh Harris and others as noted. In choosing a representative example, I have picked the historically most interesting to me, meaning all those from the 1950s, and then added 1960s brochures which best demonstrate the pattern of model development (there are a lot of mid-1960s brochures and most are very similar). By the 1970s, there weren't many new brochures produced but I have included what I have. There are a few electronic copies floating around the net which I have also “collected” but all the ones here have been scanned by the owners from original documents. They (and ads) are quite useful for research in terms of what was available when (note that images are not always of the most current trim version of a model) but not so useful regarding specs beyond the known basics or other helpful information. Even details about accessories are scarce. Compared to say a brochure for a Rolleicord or Rolleiflex, they are disappointing in the lack of detail but these were mass market models where the majority of buyers weren't interested and worse, could be put-off by perceived complexity. Or, so it may have been thought. 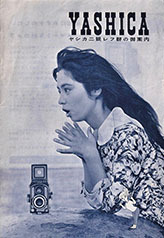 However, note that for the Japanese domestic market in the mid to late 1950s period, the “brochures” were actually booklets with lots of useful information and that Japanese user manuals in the form of “Yashicaflex Photography” were more a general photography guide than an operating instruction. I have noted elsewhere that I have seen no ads or brochures in the USA, Sweden or in any export market for late model Yashicaflexes; C, A2, A (new model), AS (new model) or B (new model) or the Yashica Rookie, A III or Auto, all of which I believe were focused on, if not restricted to, the domestic Japanese market (a few model Cs and a small group of Bs are found with feet focusing scales, the others are all metric). 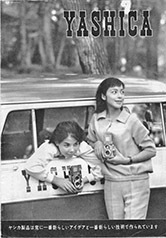 One model that I am surprised to see only a single mention of is the Yashica B and that is in a Swedish brochure printed in 1961. Note: My apologies to Japanese readers, some of the brochure scans maybe out of order or back to front. The larger booklet type brochures seem to read right to left, back to front for western readers. I have ordered the scans so that they read in the correct page order from page one to last, regardless of language convention, but if there are two side by side pages displayed, remember that the right side page is first. Click on covers below to open as a downloadable PDF (in most cases) or larger view. Complete 2 page brochure (scan provided courtesy of Chris Whelan). Basically the same as the first example except for the background colour and additional words in red on the first page. The red text blocks add some marketing hype and the red text under the cameras translates to something like “three years full warranty”. 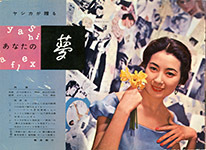 Complete 2 page brochure in Japanese (scan provided courtesy of Chris Whelan), circa 1954. Yashica Flex Model S featured on front and Yashica Flex Model B on the reverse. The Model S featured (serial number 30098) also appears on the cover of the English language user manual and is a slightly later version than in the first brochures. Complete brochure. Yashica Flex Model S, circa 1954 (scan provided courtesy of Martin Gibbs). Earliest English language brochure. Complete brochure. Yashicaflex Model S and early A series, circa early 1955 (scan provided courtesy of Tom Heckhaus) - clearly shows the link between the Yashicaflex Model S, Model AS-II and other A series models. Complete brochure. Three models, Yashicaflex Models A-I, AS-II and S, circa late 1955. From Belgium in Dutch and French, appears to be published locally. An obvious error is the claim that the AS-II is also fitted with Heliotar lenses. 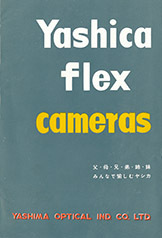 Complete brochure in Japanese, circa 1955 probably from just after the September release of the Yashicaflex C. Also features the Yashicaflex A (A-II) and Yashicaflex S. The Yashicaflex S (serial number 30098) is the same one featured with the Yashica Flex B in the third circa 1954 brochure above and also in the English language user manual. 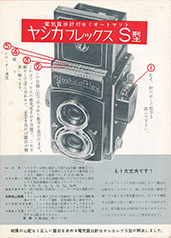 Complete brochure in Japanese, circa 1956, advertising the Yashicaflex A (A-II), Yashicaflex C and Yashica Rookie (scan provided courtesy of Chris Whelan). Unusual that cover is mainly in English. Centre spread of the new factory in Shimosuwa. Complete 1956 Japanese two page flyer advertising a photo contest and the Yashicaflex C and Yashica Rookie on the front with details of the contest and entry coupons on the back (scan provided courtesy of Leigh Harris). 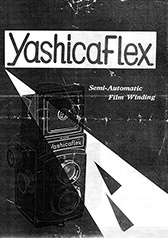 Contestants were required to use a “Yashica Flex” B, S, A, C or Rookie (the A was the export A-II, the A-I and AS models do not appear to have been available in Japan except for some early examples of the A-I). 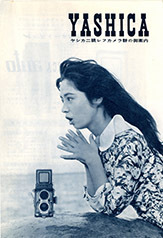 Complete 28 page booklet (including covers) in Japanese advertising Yashicaflex C, Yashicaflex A2 and Yashica Rookie. Reference to a December US review of the Yashica C and LM and scenes from the new factory. About half is made up of more general photo hints etc from a Yashica perspective. Publishing date is 15 December 1956. Several pages are translated here. Complete brochure. 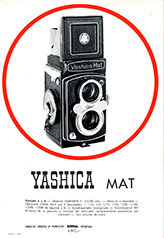 Earliest English language example with “Yashica” name - featuring “new” Yashica A, C and LM, circa 1956 or early 1957 based on original 1956 camera trim and no reference to Yashica-Mat (released April 1957) or to US subsidiary yet. US address is noted as 329 Fifth Avenue, New York, which I believe was the address of the Japan Camera Service and Information Center, the later Yashica Inc. addresses are usually given as 234 Fifth Avenue. Printed in Japan (scan provided courtesy of Tom Heckhaus). 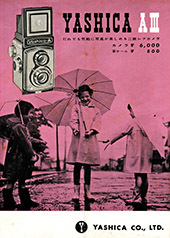 Complete two page Japanese flyer advertising 1957 Yashica-Mat and Yashicaflex AS on reverse. Picture is of first type Yashica-Mat with Copal MX shutter and 75 mm Lumaxar lenses but the ad is for the later type with 80 mm Lumaxar lenses already. 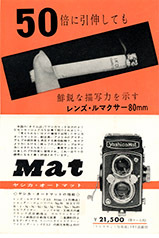 The ad makes reference to success in the US market and how American “budget conscious amateurs” and “writers” love the new camera (I am confused by the image of a cigarette, the “50” and the words which machine translate to “even stretching to double”). 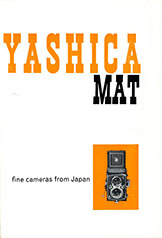 On the reverse, the large white characters on the black band translate to “Yashicaflex” but in the text, the camera is referred to as the “Yashica AS”. Japanese market Yashica cameras circa 1958 in Japanese. 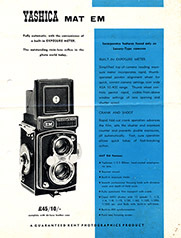 Back cover displays TLR range. Approximately 60 pages, includes Japanese market Yashica B (“Yashicaflex” on nameplate and identified as Yashicaflex B), Yashica A (not the model with “Yashica-A” on the nameplate but Yashicaflex A, new model) plus Yashica-Mat, Yashica 635 and Yashica 44 (including the seven “Symphonic Color” names). 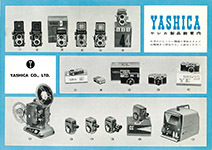 The Yashica 35 rangefinder camera and Yashica 8 and 8T-2 movie cameras and lenses, including Zunow lenses, are also featured but this time, the only evidence of the “Yasinon” name is the same cine lens with “asinon” visible. Some pages from another copy appear in various places on this site attributed to Leigh Harris. The Yashica 635 is the focus but the Yashica D is also covered. Likely to be from 1958. This is another one with the Paxton Photographics, Sydney, dealer stamp (mine this time). Complete brochure. Yashica A and D, circa 1959 (scan provided courtesy of Tom Heckhaus). Printed in Japan in English. 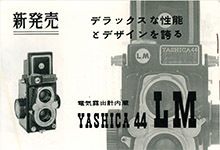 Complete 1959 16 page brochure in Japanese featuring Yashica 44LM by itself. Shows Japanese market model without red window and with fully automatic film counter reset. Seems to be introducing the model to the market. Confirms in both words and schematic that the 60 mm Yashinon is a triplet. 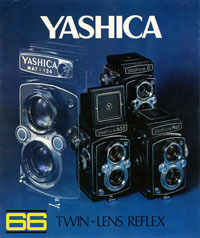 Complete double-sided Yashica 44LM brochure from Germany (scan provided courtesy of Leigh Harris). Could be from anywhere between 1959 and 1965 but features early trim. I have placed it here because in counterpoint to the above brochure and my own tests, it claims that the lenses have 4 elements. As I have mentioned elsewhere, I don't believe that is correct. 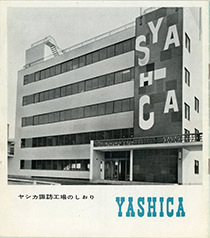 The brochure appears to be published by a local distributor rather than Yashica. 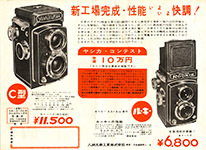 Double-sided Japanese price list circa 1959 (includes Yashica Auto and A III but not yet 44A or 44LM or Yashica 35 YF). Probably covers all TLRS, movie cameras, 35 mm cameras and Y16 on sale in the Japanese market place. Note that like with subsequent brochures, mention of Yashica-Mat, Yashica 635 and Yashicaflex Models A and B has dropped off. The first two are likely to be export only now and the Yashicaflexes have probably come to the end of the line, or about to. Complete 6 panel double sided Japanese market brochure. Yashica TLR cameras and prices almost certainly from mid to late 1959. 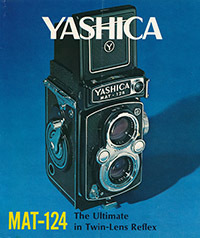 Note, this brochure is different to the next one - Yashica 44 on cover instead of Yashica 44A. In Japanese. Models covered are Yashica 44, Yashica Auto, Yashica A III, Yashicaflex Model A, Yashicaflex Model B and Yashica D, plus Yashica Automat exposure meter. 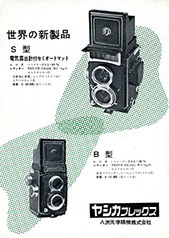 Interestingly, the almost identical Yashicaflex Model B is 200 yen cheaper than the Yashica D - run out, or was there a premium for the two-tone D? Complete 6 panel double sided Japanese market brochure. Yashica TLR cameras and prices almost certainly from early 1960 (scan provided courtesy of Chris Whelan). In Japanese. Models covered are Yashica 44A, 44LM and 44, Yashica A III, Yashica Auto and Yashica D, plus Yashica Automat exposure meter. 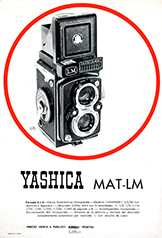 Note, the Yashica A III is shown with a focusing hood logo and the Yashica D without one which is back to front from what has been found in the Japanese marketplace and websites. 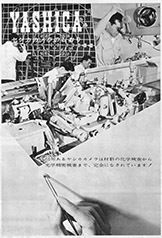 Double sided flyer featuring the A III. As noted above, the camera is shown with a hood logo whereas all found examples are without (scan provided courtesy of Leigh Harris). Complete brochure. Full line of Yashica cameras, circa 1959. Printed in USA. Address listed as 234 Fifth Avenue, New York. 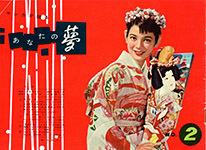 Japanese brochure about the company and factory, circa 1960. Complete 7 double pages plus covers. 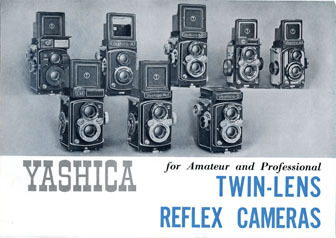 Two pages of TLRs from larger Yashica brochure, circa 1960 (scan provided courtesy of Chris Whelan). Printed in USA. Note Yashica Mat-LM in user manual is from Nov 1959 but production didn't seem to start until early 1960. The Mat-LM in this brochure and the next have the earlier hood logos not found in the wild (yet). This one still has the plain Mat cover under the crank-wind also not seen in the wild. Complete brochure. Yashica Mat-LM, circa 1960 (scan provided courtesy of Tom Heckhaus). Printed in Japan in English. 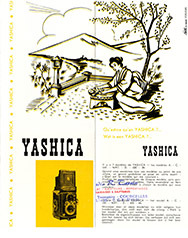 Two page Spanish Yashica-Mat flyer (scan provided courtesy of Leigh Harris). Circa 1960 based on similar Mat-LM flyer below but trim is 1957 including the original 75 mm Lumaxar lenses (Yashinon specified in the text). Two page Spanish Yashica Mat-LM flyer (scan provided courtesy of Leigh Harris). Circa 1960, still has the early hood logo and plain Mat cover under the crank-wind not seen in the wild. Complete brochure. Yashica 44LM & 44A printed in Sweden in 1960 in Swedish (scan provided courtesy of Göran Årelind). 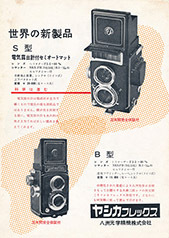 Complete Yashica 44LM and 44A brochure, English version of above Swedish one, printed in Japan (scan provided courtesy of Gordon Brown). Complete brochure. Yashica Swedish TLR range, including Yashica B, 1961 (original provided courtesy of Göran Årelind). Printed in Sweden in Swedish. Note, picture of Yashica-Mat inside is of 1957 release version complete with Copal MX shutter. 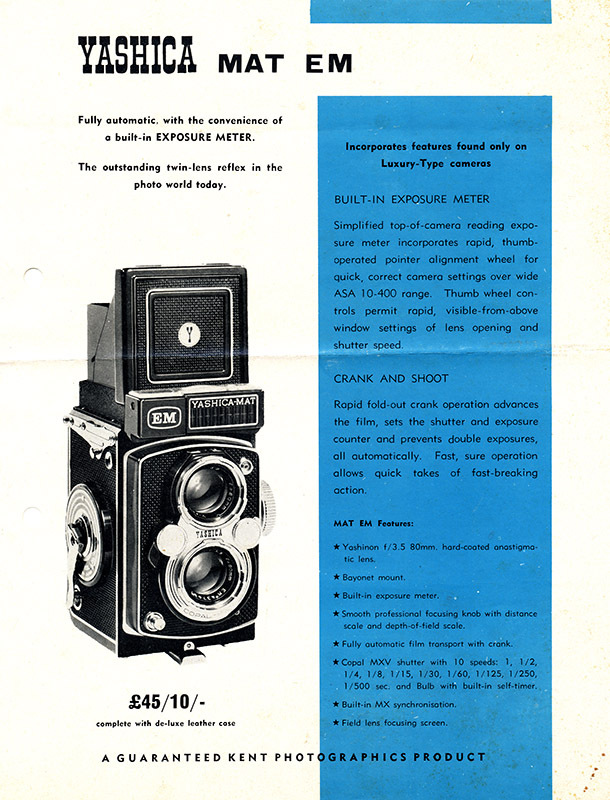 UK importer Photax brochure, possibly 1961 from code. Features Yashica-Mat as well as Yashica Mat-LM, Yashica D and Yashica 635 (scan provided courtesy of Leigh Harris). 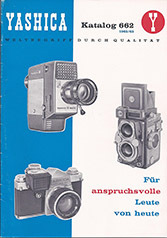 Partial German Yashica catalogue for 1962/63, prices effective from 1 June 1962 (scan provided courtesy of Chris Whelan). Only TLR and tripod pages scanned. Yashica Mat-LM taking lens number is the same as the camera in the 1959 user manual and the Mat-LM brochure above. 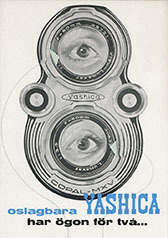 Complete Yashica product brochure by Australian importer Swift & Bleakley circa 1962. Little TLR content but does include some TLR accessories and general items such as flash units and tripods. Complete brochure. Yashica Mat-EM, circa 1964. Printed in Japan in English. Complete brochure. Yashica TLR range, circa 1964 (original provided courtesy of Göran Årelind). Printed in Japan in English. Yashica E dates this brochure to around 1964, both Yashica 44A and 44LM are still included. Complete brochure. Yashica UK TLR range, circa 1964 (original provided courtesy of Göran Årelind). Printed in UK by importer Photax, includes list of accessories. Complete brochure. Yashica E, new model, circa 1964. Contrary to everyone else, I am saying production started June 1963 and production of the updated version started in January 1964. Printed in Japan in English. Complete German brochure. Covers Yashica TLR range and features second version of Yashica E and Yashica 44LM but not 44A (see also the 1965 Belgian brochure below), circa 1964 (scan provided courtesy of Flickr user Toyomusen, arranged by Chris Whelan). Printed in Japan in German. Complete brochure. Except for cover and inclusion of auxiliary wide angle and telephoto lenses, same as circa 1964 version in German including missing 44A (scan provided courtesy of Gordon Brown). Printed in Japan in English. Featuring TLR pages from a wider Belgian product range brochure (scan provided courtesy of Chris Whelan). 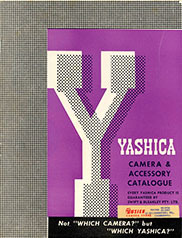 The main point of interest is the 1965 date on the cover (just to the left of the “Y”) and the inclusion of the Yashica 44. In both Dutch and French. Complete brochure. 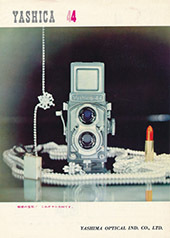 Yashica 24, circa 1965. Printed in Japan in English. Complete brochure. Yashica TLR range, 1966 (scan provided courtesy of Tom Heckhaus). Printed in USA. Focus on the Yashica 24 and Yashica E and 44LM have finally dropped off. Note, some accessories are listed. Complete brochure. Yashica Mat-124, circa 1968 (scan provided courtesy of Tom Heckhaus). Printed in Japan in English. Complete brochure. Yashica Mat-124, circa 1968 (scan provided courtesy of Chris Whelan). Printed in Japan in English. Complete brochure. 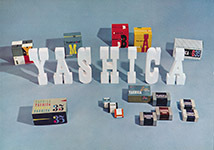 Yashica TLR range, circa 1968 (original provided courtesy of Göran Årelind). Printed in Japan in English. 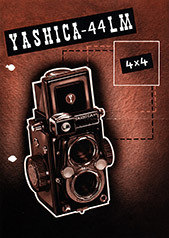 Displays Yashica Mat-124 and other 66 models still available, all in late trim livery. Some accessories listed. Complete USA 1969 price list for all formats and accessories including TLRs. Note inclusion of close-up lenses in 32 mm slip-on mount (scan provided courtesy of Chris Whelan). Complete USA 1970 price list as for the 1969 version above (scan provided courtesy of Jim Hurtle). 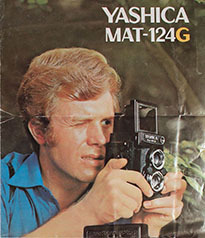 From a TLR perspective, the main difference is that the Yashica A has been dropped from the list and both the Yashica D and 635 have had a $10 price increase even though the Yashinon lenses would not arrive until July 1970 (the price list was effective from 1 March 1970). 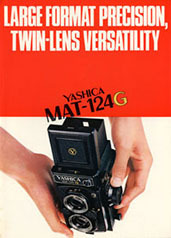 Yashica Mat-124G page (JPEG) from Japanese brochure (scan provided courtesy of Chris Whelan). Camera with lens serial number and close-up lenses with chrome bezels date this from early 1970s. Quoted prices are; camera 36,000 yen; ever-ready case 1,500 yen; telephoto lens set 7,000 yen; wide angle lens set (not shown) 6,500 yen and No. 1 & 2 close-up sets 2,400 yen each. Complete double sided brochure opens out to poster size (scan provided courtesy of Jim Hurtle). Printed in West Germany in English with only US addresses listed. The main featured camera has serial number 0054398, which translates to May 1970, almost certainly pre-production with series production getting underway around September so likely to be an earlier brochure. Includes useful information about auxiliary and close-up lenses. Complete brochure. Yashica Mat-124G, circa 1983. Kyocera address on back. Printed in West Germany in English. I have a downloaded presumably later version with Kyocera branding on the cover page, blue replacing the orange of the banner, more Kyocera addresses on the back page and it is printed in Japan in English - otherwise it is the same. There also appears to be a similar Japanese language version of the orange banner type (I have only seen the front and one inside page) and a different version with different cover but the same back page.